The book titled Ten-ko-kai-bu-tsu is a book about technology of industries. This book had been wrote by Mr.So-Oh-Sei in China on 1637,last of Min era. This book collects systematically and describes production techniques for agricultural products, clothes(dresses), firearms and metal products with illustrations. The production technique of chain is written in this book. �@When any ship on a voyage can not lie at moorings of any port, its destiny entrust to anchor with chain. At first, 1 center pole and 4 nails are forged , at next step, each nail is connected by forging. In the case of anchor weight up to 300kin,iron bed called " Ka-na-shi-ki" having 1 sha-ku(33 centimeter) circle shape is used for this work. Kanashiki is settled near by furnace. When each joint portion of center pole and nail to become at white heat, wood charcoals are took away from furnace and center pole and nail are grasped with rod covered with iron material and are settled on Ka-na-shi-ki. In the case of anchor having weight of about 1000kin, Foot bath is constructed with wood pole. Many people stand on the foot bath. They make each joint portion of center pole and nail to face to face by grasping chains tied with each part. Ends of these chains are tied with great iron circle or chain stopper. 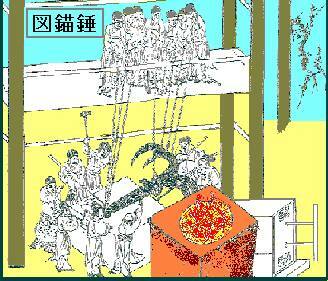 People pull up and change pose of a product(center pole with nail) and forge to connect by collecting strength of all people. We did not use Yellow clay as a joiner. At first, sift out old plaster to small particles and scatter plaster particles between connected faces, then there is no gap between faces. This anchor is the greatest product among forging materials in Ka-ji-ya.